The Sunchaser II can be ordered online on by telephone and will be delivered by a freight carrier, right to your door. You can call or email for a shipping quote (depends on zip code, generally $600 - 900). Or place your order now, pay $600 toward the shipping, and we'll contact you about adjusting the shipping charge. Usually arives in about 2 weeks. Toll free in US: 1-888-Joy-Sail (eastern time zone) or worldwide 978 263 7598. Email Jim@SailboatsToGo.com. More info, or To Buy: Click Here Price is $4871 plus shipping. *($600 shipping will be charged initially as a placeholder but your final cost could be more or less than this. The shipping charge will be adjusted later, with your permission, once actual shipping cost is known). Bonus offer - 2 lifejackets, just for putting the word "Bonus" in the comment space when you check out. Or if you prefer, choose this bag to protect you sail and spars for car topping and storage as your bonus instead. We also offer the Sunchaser I, which has just one sail, so it costs less and sets up more quickly. But it's not as fast. Same hull. Sunchaser owners love their boats. Many have posted videos. See below. Main Sail Area 80 sq. ft.
Jib Sail Area 20 sq. ft.
Max. Motor Power - 5 HP or any size electric trolling motor. We recommend against gas motors because gas spills could damage the hull if not wiped off right away. Note: Snark has eliminated the dagger board plug in current design, though it is still listed in instructions. This owner video gets better and better as it continues, so don't jump ship early! (click arrow in center of image). 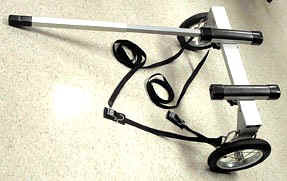 Trailer for Canoe, Kayak or Small Boat - FREEShipping!